The Coopered Tot: Part 3 of Corroborating the Value Whisky Review Water Integration Experiment - more time. Part 3 of Corroborating the Value Whisky Review Water Integration Experiment - more time. Before I begin I must state that the inspiration for this series of experiments, Ryan of Value Whisky Reviews, has decided to hang it up and stop blogging. I'm sad to see him stop, but respect his decision in light of the personal reasons he gave. However the inspiration of Ryan's approach burns bright. His fascinating empirical studies on the effects of oxidation and evaporation on the flavor of whiskies in open bottles and his water integration experiment particularly captivate me. I will be repeating these experiments, as I had already begun to do - and will endeavor to think like Ryan and bring some structure and rigor in figuring out new experimental approaches to the issues of enjoying and living with these vibrant and mercurial elixirs. Now, about the water integration I wrote two posts on last week: no, I'm not done, not by a long shot. Where we left off last week was that I had successfully corroborated Ryan of http://valuewhisky.blogspot.com/ conclusion that allowing a rest period of a couple of days after diluting whisky produced a smoother, more rounded, better integrated result. However there were troubling aspects to this conclusion: the nose and the sugar notes of the entry were muted and rounded along with the heat. I wondered, what would additional time do. 1) Bookers diluted with only 1/8 volume of water allowed to integrate for 9 days. The idea here is to rectify the problem of the unacceptable loss of opening sweetness. Bookers at 7/8 is 111.9 proof. This is, granted, very high. Just the edge off. Nose: much of the full Bookers nose is now in evidence after a week: brown sugar, cherry compote, molasses, corn pone, tobacco and fresh sawn oak. The nose is more relaxed and less hot than the uncut version - but unlike the previous dilution experiments it comes off as an integrated whole. Opening is bright and sharp with brown sugar - yes the sugars that were too muted at 4/5 are well present at 7/8 and a week of water integration. Midpalate expansion is sharp and hot with jammy bitter orange, stewed peaches, and rich oak. The mouthfeel is good - not rich but at least as full as the uncut. The turn is full of bitter wood, and the sour tang so distinctive of Jim Beam's mash, and dark char. It's a heady stew. I'm not certain it works as a sipping whisky to rival the really good ones - but it's in the ballpark. Its also noticeably easier to drink than uncut Bookers - still hot but not quite as debilitatingly so. There's no hint that this is a dilution. Unless you had it side by side with the uncut stuff it wouldn't occur to you. 2) Port Charlotte PC7 at the previous 4/5th dilution, but allowed to integrate for 8 days. Nose: earthy peat with a note of iodine, salt, library paste and a hint of distant mint. There's also some tar and bacon. Entry is sweet and round and rich with toffee malt, oatmeal and mead. Midpalate expansion is big and forceful with earthy peat arriving in a big way. The fade sees the peat turn to tar and ash with a deep anthracite coal combustion note. This is unmistakably Port Charlotte, but the big burn is gone. Some of the razor sharp sugar intensity is gone too, but without an uncut dram to directly compare you would be hard pressed to notice. This is fine Islay dram that doesn't read as a dilution at all. The key ingredient is time. A splash of water is not just a splash of water - that's the big lesson here. What begins as thin, watery, and diluted ends up tightly bound with the flavor signature that originally was there. I suspect that congeners and flavor compounds in whisky are not readily soluble in water. When water is first added it doesn't dissolve an essential aspect. You taste the poorly integrated water. After a marrying period the water becomes more fully integrated with a richer mouth feel, more sugars apparent up front, less spirit heat, and more rounded presentation in general. As far as I know, this effect wasn't documented before Ryan's post. There have been some excellent posts on the effects of a splash of water in general, however. My favorite is New perspectives on whisky and water by Martin Lersch / June 3rd, 2007 in Khymos. It describes the process as follows: "Malt whisky contains high concentrations of esters and alcohols with long hydrocarbon chains. When water is added, the solubility of these esters and alcohols decreases, and a supersaturated solution results"... "The over-all effect is a fractionation of volatile compounds upon dilution with water: water insoluble compounds are concentrated in the aggregates (or micelles) of long chain esters, water soluble compounds remain in solution and compounds (probably those which are slightly soluble in water) that were originally trapped in ethanol micelles are liberated. 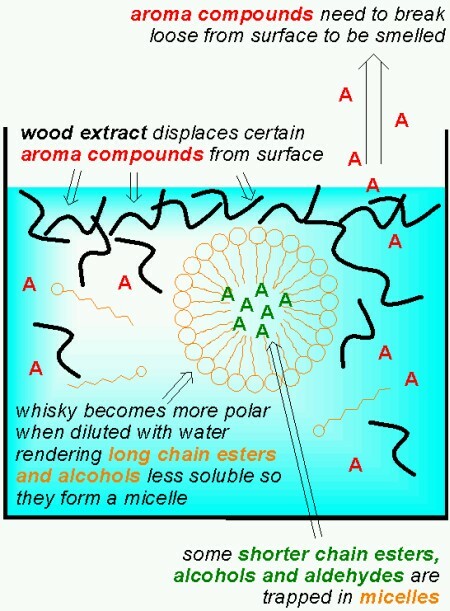 "... "So after all, the popular notion that addition of water “opens up” the aroma of a whisky is true, but who would have thought that the effect is a combination of “masking” (inclusion of some arome compounds in long chain ester micelles) and “demasking” (opening up of ethanol micelles)". 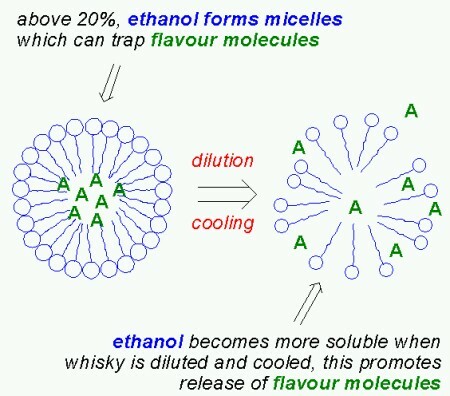 All of this explains how adding water transforms the flavor of whisky both by exposing something hidden, breaking up congeners locked in micelles, and by muting some other flavor elements by locking them up in bunches caused by supersaturation. However, the issue of time is not explicitly discussed in the article. Do all of these things happen at once? Do they happen over hours? Days? Weeks? My experience is that big changes happen over the first 30 minutes, but additional changes are clearly detected after 2 days and even more changes are clearly detected after 8 and 9 days. Things really start to get good after extended marrying time. Why? At the moment I don't have a clue. However these three experiments show me that Ryan has discovered something profoundly true about marrying time for whisky and water. The final question is "so what"? Am I really going to dilute and vat my cask strength whisky a week or more before drinking it? In most cases, no. The distilleries do that most of the time. The results of these experiments don't suggest a clear course of action in my opinion. I will drink cask strength whisky undiluted most of the time. I have gained the knowledge, however, that marrying time produces a smoother, less hot, more integrated dram. This effect continues for many days. This a data point; more information. Use it as you see fit. Wow, great post! I didn't expect that it would keep evolving significantly after the initial couple days. I've thought about your closing question: "so what?" You're right, you'd need to really hate the intensity of your cask-strength whisky to actually dilute the bottle. But I think there is one clear-cut consequence: don't buy cask-strength bottles of whisky thinking that you're just going to dilute it later! That notion travels around even in the highest reaches of professional whisky writers. The whisky "experts" say that you buy a bottle of cask strength because you're "smart enough" to be able to dilute your own whisky. But, that notion has been debunked here. If you don't want to drink cask-strength, don't buy cask-strength. That's the lesson. Thanks, Ryan, for nailing the conclusion (and coming up with the concept in the first place). There are two different things going on with water. There's the "add 3 drops with a straw" (or teaspoon) to alter the flavor profile a little (that works fine). Then there's the "dilute cask strength if it's too hot". It's the latter that is debunked. You can dilute effectively if you have hours for integration (and preferably a week or more - as it keeps getting better over the course of days). However, diluting on the spot ruins the flavor and texture because the water requires time for integration. G-LO! Thanks for dropping by. I agree completely that different whisk/e/ys at cask strength take dilution in different ways. That's exactly what I found with Bookers versus Port Charlotte 7. PC7 diluted in a tastier way right off the bat and integrated better at a higher dilution ration than the Bookers did. I'll be looking to do this with a sherry bomb and a sweet spey at cask strength. I'll be trying to identify general principles that might be usable to make predictions. However - that wasn't the topic of the series of posts. The issue was whether water integrates better with whisky over time. Integration time makes a huge difference in the way the water sits with the whisky. The same amount of water tastes more watery and hotter immediately after dilution than it does later. After a week in a bottle, the same dilution that seemed watery and still hot becomes smooth, well integrated and not watery at all. Spirit heat is reduced, mouth feel is richer etc... This effect was true for both the PC7 and the Bookers - and in pretty much the same degree. This does seem to be a universal conclusion. If this is confirmed with a 3rd cask strength test I'll have high confidence in this result. My Bookers CO4-a-28 is hot with a bitter alcohol taste. Hardly had structure.Even mouths later. Even one co4 review mention he had to add ice which he did not need to years ago. I might vat some with water in a empty 50ml. C02-A-18 was not hot and sharp and the alcohol was hidden. It was loaded with moth filling big fat oily virgin tannins It glided down. I think Bruichladdich is entire different. It's like a living product. What changes take place is always fun.